After the Read All About It rapper tweeted about burning his tongue on a roast potato, the hip-hop duo - Jordan 'Rizzle' Stephens and Harley 'Sylvester' Alexander-Sule - took a pop at him, writing: "No one cares." The spat heightened when Professor Green (whose real name is Stephen Manderson) replied: "Did you ask your manager for permission to tweet that?" He later went for a low blow, when he added: "Any future colabs (collaborations) he can have sign off, I understand content being a delicate matter when most of your fans are 12," to which Rizzle Kicks replied: "haha, yeah! And I understand collabs being a delicate matter when most of your fans don't buy your records." 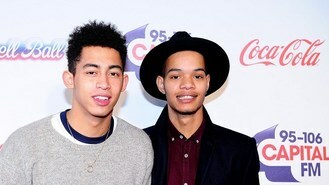 And when the rapper said: "If you haven't been to a @RizzleKicks show but have seen the redcoats at Butlins you in fact have seen a @RizzleKicks show," t he pop pair retaliated by making reference to Green's recent drink-driving case, when he received a one-year ban. They posted a photo of a car crash with a giant potato, with the caption: "P rofessor Green's worst nightmare." Professor Green later admitted the spat wasn't serious, by saying: "If a conversation that would normally take place over a tin and a game of FIFA constitutes war or even an argument we're all f*****." The trio have been in the studio together, working on the track Name In Lights, which could appear on Professor Green's third album, Growing Up In Public, which is due to be released in May.